The start of the 2017 RMC Obstacle Course Race took place right on schedule on Friday afternoon under cloudy skies and 12 degree weather. Flights tackled the 12 obstacles as a team, and the start was staggered – unlike recent past years, where it was a shotgun start. Spirits were high! Family and friends of the participating cadets were out in full force. 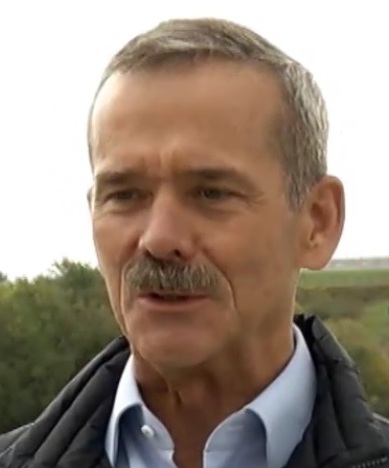 A special incentive for the Class of 2021 was the appearance of 13738 Chris Hadfield who was returning to celebrate his 35th year of graduation from RMC. The order in which flights commenced was based on their performance during the Warrior Race, Regatta and the Director of Cadets Inspection. Most of all, this is a fun and physically-active team activity that tests cadets to excel both mentally and physically – in short, it’s all about leadership, teamwork and confidence. Each obstacle was tough- there were no freebies! The flight which completed the Obstacle Course in the least amount of time was declared the winner. Upon completion, all Officer Cadets assembled by squadron, at which time, first year Officer Cadets receives their RMC coin from members of the Old Brigade. We plan to update the obstacle course albums over the next few days – feel free to check back! “The obstacle course met my expectations. As I previously said, my role as the was to mentor and provide direction to the FYOP 2IC, OCdt Bellerose, and his team of second year cadets who were responsible for building and executing the Obstacle Course. They did an excellent job and I have nothing but praise for him and his team. As you know, we switched from a shotgun to staggered start this year and I for one am very happy with the result. The event was complete by 1630 hrs and having flights all run the same course on a specific time interval prevented any hold ups between first year flights. I also thought having every flight finish at the same point turned it in to more of a spectacle for the cadets and their parents. Overall, I am very happy with how the Obstacle Course turned out. My biggest surprise was the amount of smiles on the Cadets faces when they finished the Obstacle Course. The pride and positive attitude these Cadets display is a breath of fresh air. If I had to have a disappointment, it would be with equipment. Some of the kit we have been using to build the Obstacle Course is in need of replacement. Luckily, I’ve been in contact with the RMC Foundation and the plan is to note what equipment deficiencies we have and acquire new equipment for next year. 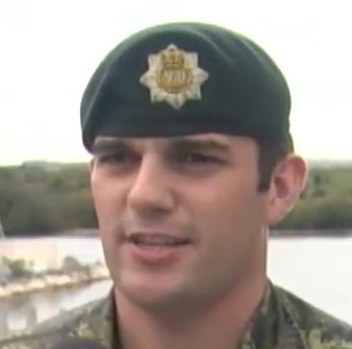 Most RMC cadets like to believe that they had it harder and that they were better than the guys who came after them. This is especially when considering FYOP/Recruit term and the culminating obstacle course. I, however, think that sometimes the opposite is true. On Friday, the 12 first year flights and their respective squadrons gathered on the parade, in their full tribal (squadron) garb, ready to compete against one another in the hour-long obstacle course. The loud music and cheering were deafening. Then, a calm came over the crowd as the Director of Cadets, Colonel Chris Ayotte addressed the parade. The Colonel, who also had the privilege to address the Class of 2021 on their Arch parade, reiterated his message from then: that FYOP would push them to their mental and physical limits and in that process, they would become a single cohesive unit. Upon the conclusion of the DCdts’ speech, the 12 flights gathered at their starting point. This year, the obstacle course was staggered, with each flight starting eight minutes behind the one before them. My Squadron’s first year flight, Hunter Flight, was chosen to start because of their performance on the FYOP Regatta and other activities. 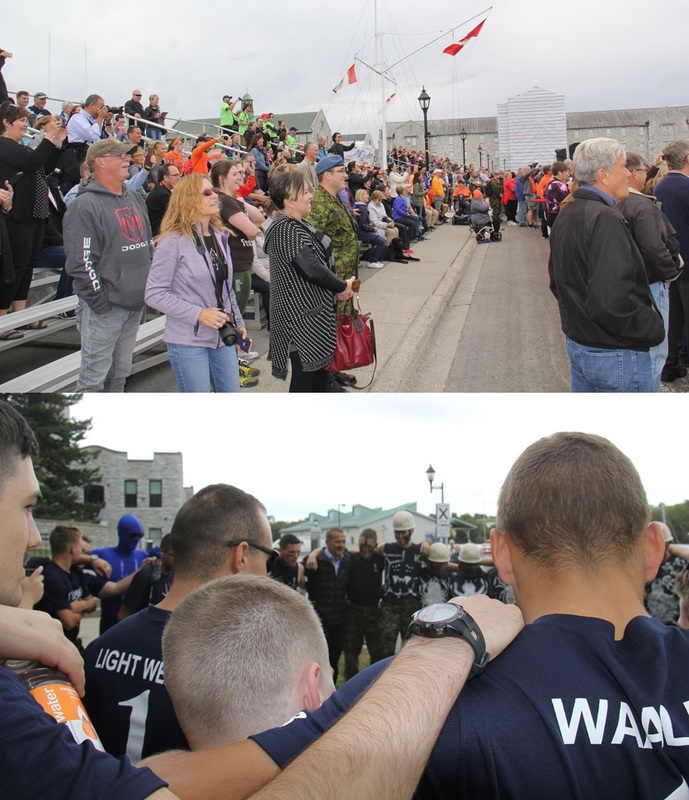 At the sound of the cannon, Hunter flight sprinted to the first obstacle, the rope bridge, followed closely by their squadron mates, friends and families. Their determination and teamwork was incredible and they conquered this first obstacle with ease and efficiency. As the first years kept going, it was quickly becoming obvious that were becoming exhausted. Motivated by their squadron mates and FYOP staff, they kept on going strong and continued to fight. Even under immense pressure and physical exhaustion, Hunter Flight’s IC (the first year chosen to lead their flight), OCdt Vautour, continued to show steady leadership. Following 11 gruelling obstacles, they arrived at their final challenge, the gut check. Essentially, the gut check involves carrying several ammunition containers, full jerry cans and a stretcher with a “casualty” lying on top, lengthwise across the parade square several times. 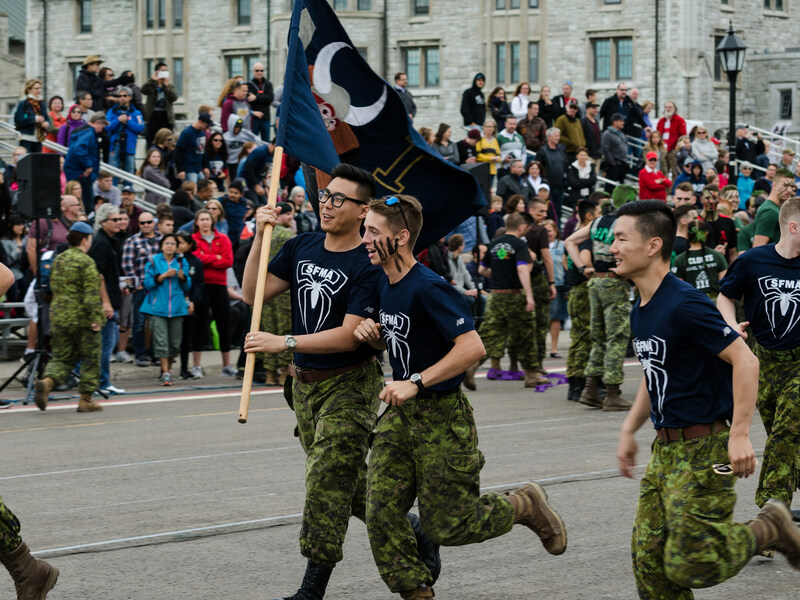 Given the level of physical exertion and the fact that the RMC parade square is 145 meters long (according to Google Maps), or about 25 meters longer than a football, Hunter flight had to dig deep to find that last bit of fuel to finish their fight. Followed closely by their squadron mates as they hurried across the seemingly unending parade square, Hunter flight was able to find an inner strength that they perhaps did not know they had. After dropping the last ammo container, the flight huddled in a circle, surrounded by their squadron. Victorious, they had finished the obstacle course and a long five weeks of FYOP. Upon completing the obstacle course, the Class of 2021 received their RMC pewter coins from a member of the old brigade. Each coin is engraved with their student number and the exchange represents the bond that exists between the cadets of the past and those of today. After that short ceremony, they ran to the pier and had the chance to jump into the lake with their squadron. Thinking that I was still as eager as when I was a first year, I decided to follow them into the water, only to find that it was colder than Antarctica. Finally, the first years had a chance to shower, put on civilian clothing and leave the peninsula with their friends and families for the first time in five weeks, a well-deserved break for the Cadet Wing’s newest additions. On Friday, September 29th, the RMC class of 2021 completed FYOP with their participation in the obstacle course. After five weeks of hard training, the twelve first year flights conquered twelve obstacles. From the mud pit to the maritime crossing, the truck pull to the cargo net, the officer and naval cadets used their new skills and support from each other and their FYOP staff to successfully complete the course. For the 4th year in a row, 5 squadron came out on top, led by OCdt Liam Edwards. The completion of the obstacle course was a big step for the first years, and an opportunity for them to show their skills, leadership and teamwork before commencing their RMC career. The course was both physically and mentally demanding, and it took blood, sweat and tears to complete, and as we saw on the last obstacle, some puke too. 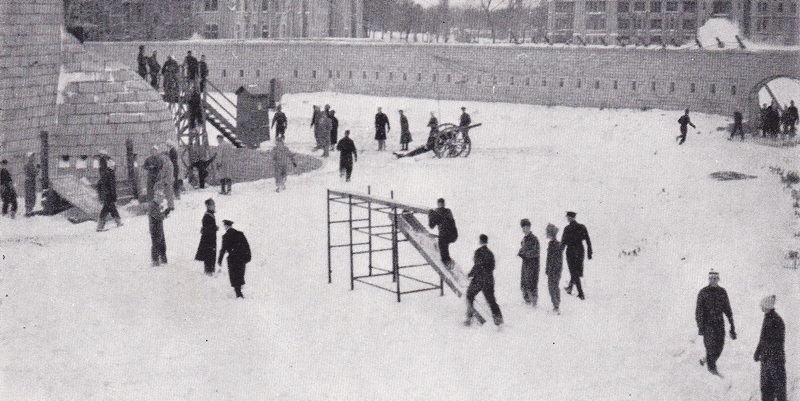 Looking back at the obstacle course in 1949 – 66 years ago! The morning of the 23rd of November was eyed with much apprehension by the present class of recruits, for this was the day they were to run the 1949 edition of the obstacle race. As fortune would have it, there was several inches of fresh snow covering the course, much to the delight of the second year cadets who turned out in full force, along with the staff and visitors, to watch this popular event. The course was constructed by the recruits, much to their dismay, under the supervision of second year cadets. Thanks to the fiendish ideas of many of the veterans who ran the New One Hundred’s edition of the race, the course was much longer and somewhat more of a nightmare this year. Starting en masse in front of the old hospital on the parade square, the participants raced along the new football field to the first obstacle, a row of tarpaulins firmly secured the ground. Under these, a struggling mass of recruits fought and bullied their way to freedom. Next they were confronted with a solid wall, which was successfully assaulted only be means of cooperation between the cadets. From this they ran to shimmy up slippery telephone poles to the top of the wall surrounding the fort, and then managed to make their way across a network of ropes suspended from the top of the Martello Tower to the wall. Dropping to the ground about halfway between the tower and the wall, the cadets found themselves in a mad race over scrambling nets, catwalks, and barricades to the tunnels through the embankment. Completely darkened by means of canvas over the doorways, and filled with boards, boxes and other such obstructive articles, these tunnels presented a most trying obstacle and produced a demoralizing effect. After scrambling through one tunnel, the recruits desperately struggled up the side of the embankment under tarpaulins, only to run up an icy ramp, down the other side of the embankment through some suspended tires to be confronted with another such passage-way. From this, a mad leap was made into the moat surrounding the Martello Tower, and after climbing over a dolly, the recruits were faced with the task of getting over the wall of the fort by means of ropes. The home-stretch lay from here to the Old Gym, and very few were noticed to be springing this weary, final grind. Tired but happy that the ordeal was over, the recruits all came through the race in fine style, with only a few minor injuries. The winner was Al Derrick of No. 3 Squadron, followed by Mike Findlay of No. 1 and Gil Ross of No. 2 in second and third places. The event brought out the best in Inter-Squadron competition and sportsmanship-many a cadet stopped to aid his buddies along, perhaps forfeiting his own chances of winning the race. Now, no doubt, the present recruits are fiendishly planning the course that they will design and build for the new class coming to the College in September.